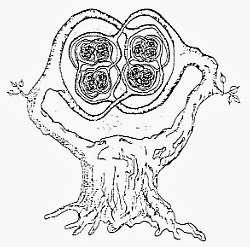 Anyway, the stick and lattice knots above are very nice knots, not wild at all, but the first question we have to ask about such knots is this: given a knot, can we always represent it in such a fashion? And if so, what is the fewest number of sticks that we can use (the stick number)? In the first example we have a stick knot for which the only requirement is that the sticks be sticks. In the second picture we also require that the sticks sit on a cubic integer lattice, which means that more sticks are required. 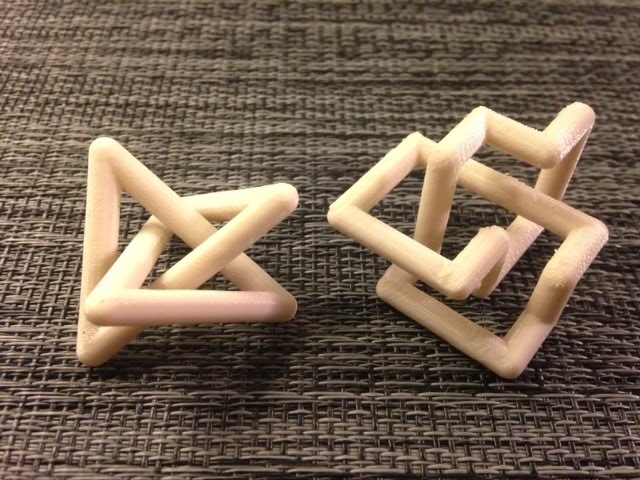 People also study knots made out of sticks that are all the same length ("equilateral" stick knots) and knots that are made out of sticks with the same length and the same angle between each adjacent pair of sticks ("alpha-regular" stick knots). The stick knot model of the trefoil above illustrates that 6 is the minimum possible number of sticks that can be used to make a trefoil. The right-angled lattice knot on the right side of the picture illustrates that 24 units is the minimum length of rope that can be used to make the trefoil in the cubic lattice. Technical notes, OpenSCAD flavor: The code for these knots is easy; each knot is constructed from a very small number of spheres at specific coordinates which are combined in "hulls" when adjacent. The coordinate data is from The Knot Server. And yes, this is ridiculously stupid OpenSCAD code but it makes pretty knots anyway!